When I was a child, going into Philadelphia between Thanksgiving and Christmas was pure magic. In those days, the holidays were those set few weeks, and every department store went all out decorating and enticing the public with twinkle, sparkle and shimmer. Strawbridge & Clothiers, Lit Brothers, Gimbles were all pretty good – but nobody beat John Wanamaker’s, with their massive eagle in the Great Hall and the gorgeous, booming organ. I remember one particular Saturday afternoon when it was even more crowded than usual. In my fascination with one of the Christmas displays, I got separated from my parents. Where had they gone? I was a little kid – would they see me among all the tall, rushing grownups? It was so noisy, I knew if I called they wouldn’t hear me. I started to panic. A moment later, Dad scooped me up. “How did you find me?” I asked. He chuckled. “We went upstairs, and when we looked down, there was only one little girl in a purple striped hat and purple mittens.” Instead of panicking, he and Mom had gone up to the balcony overlooking the Great Hall, and as soon as Mom spotted me, Dad went to fetch me. Sometimes, that’s what life is like. We feel crowded by the maelstrom in which we find ourselves. A situation has so many moving parts, so many people involved, that we can’t get a good “fix” on what we need to do. Whether it’s a situation that needs an immediate decision, a habit we have that we can’t seem to break and that affects all parts of our life, or a breakdown in communications among a group of friends that is negatively engulfing us, Clarity is the only thing that will let us see – and seize – what to do. That’s when what I call a “God’s Eye View” comes in handy. Imagine you are a hundred-foot-tall deity standing on top of a cliff. You look down upon a village. You watch it for a long time. You can see the births and the deaths, the marriages and the divorces, the alliances and the squabbles. But as you observe—because you are not in the midst of everything—you merely notice the patterns. You stay objective in your view. Now, take whatever it is that’s causing your mental fog and view it in the same detached way. Rise above the situation, above the emotions, above the worries, above the feelings of stress. What happens? Are you clearer? Do things settle down? When we are not in the midst of our problems and challenges—but can step away (or step up) to view them from the outside—patterns and repeated behaviors become clearer. Our ways of self-sabotage stand out. 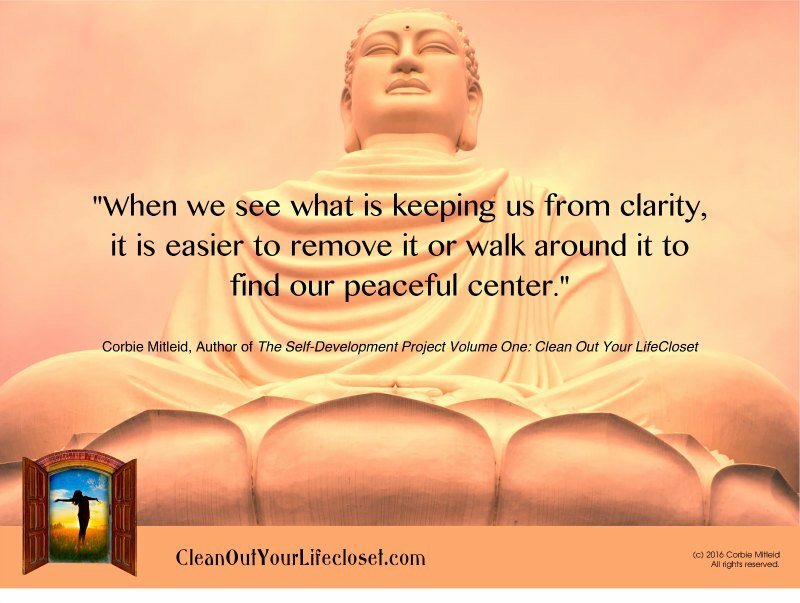 And when we see what is keeping us from clarity, it is easier to remove it or walk around it to find our peaceful center.